Allah the Most High says: My servant has Praised Me. He (Allah the Most High) says: My servant has lauded Me. He (Allah the most high) says: This is Between Me and My servant, and My servant will receive what he asks for. He (Allah the most high) says: This is for My servant, and My servant will receive what he asks for. [Malik’s Muwatta, Book #3, Hadith #3.10.41] “Yahya related to me from Malik from al-Ala ibn Abd ar-Rahman ibn Ya'qub that he heard Abu's-Sa'ib, the mawla of Hisham ibn Zuhra, say he had heard Abu Hurayra say, "I heard the Messenger of Allah, may Allah bless him and grant him peace, say, 'Whoever prays a prayer without reciting the umm al-Qur'an in it, his prayer is aborted, it is aborted, it is aborted, incomplete.' So I said, 'Abu Hurayra, sometimes I am behind the imam. 'He pulled my forearm and said, 'Recite it to your self, O Persian, for I heard the Messenger of Allah, may Allah bless him and grant him peace, say that Allah the Blessed, the Exalted, said, "I have divided the prayer into two halves Between me and my slave. One half of it is for Me and one half of it is for My slave, and My slave has what he asks." 'The Messenger of Allah, may Allah bless him and grant him peace, said, "Recite." The slave says, 'Praise Be to Allah, the Lord of the Worlds.' Allah the Blessed, the Exalted, says, 'My slave has Praised Me.' The slave says, 'The Merciful, the Compassionate.' Allah says, 'My slave has spoken well of Me.' The slave says, 'Master of the Day of the Deen.' Allah says, 'My slave has glorified Me.' The slave says, 'You alone we worship and You alone we ask for help. 'Allah says, 'This ayat is Between Me and My slave, and for My slave is what he asks. 'The slave says, 'Guide us in the straight Path, the Path of those whom You have blessed, not of those with whom You are angry, nor those who are in error. ' Allah says, 'These are for My slaves, and for my slave is what he asks .' "
This Sura is in fact a prayer which Allah has taught to all those who want to make a study of his book. It has been placed at the very beginning of the book to teach this lesson to the reader: if you sincerely want to benefit from the Quran you should offer this prayer to the Lord of the Universe. This preface is meant to create a strong desire in the heart of the reader to seek guidance from the Lord of the Universe who alone can grant it. Thus Al- Fatihah indirectly teaches that the best thing for a man is to pray for guidance to the straight path to study the Quran with the mental attitude of a seeker- after-truth and to recognize the fact that the Lord of the Universe is the source of all knowledge. He should therefor begin the study of the Quran with a prayer to him for guidance. 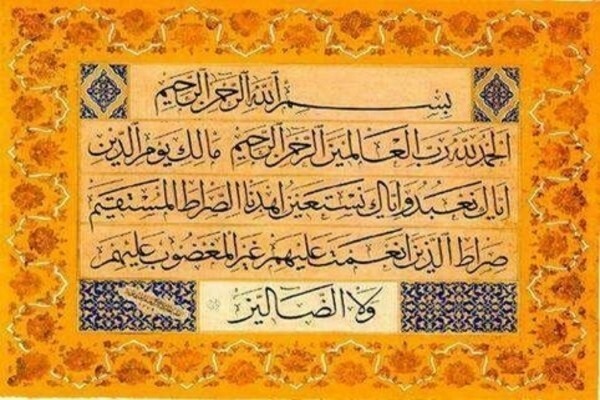 From this theme it becomes clear that the real relation between Al-Fatihah and the Quran is not that of an introduction to a book but that of a prayer and its answer. Al-Fatihah is the prayer from the servant and the Quran is the answer from the Master to his prayer. The servant prays to Allah to show him guidance and the Master places the whole of the Quran before him in answer to his prayer as if to say This is the Guidance you begged from Me.